Hey everyone! So today I'm starting something on M$M that I'll loosely coin “The Normal People Series” (I might come up with a more creative name later…who knows). I get a ton of reader questions and requests, and sometimes I don't have the life experience yet to write about those topics. That's why I'm turning to some of my readers that have awesome stories based on real-life situations. Today I have Brad, who is a member of the M$M private Facebook group. He and his wife had their first child 6 months ago! Like a lot of couples that read the site, they were both working hard at their jobs and getting ahead financially. After they had the baby, they decided that dropping down to one income so Brad's wife could stay home was the right call for them. So, obviously…they had to figure out how to make it work. 1. Did you both stick to a budget before you had a child? What were your finances like before? We did, though in slightly different manners. I'm a very detail oriented left brain type of person, so I've been keeping a budget in a spreadsheet since college and have moved on to products life Mint and Every Dollar in the last 5 years or so. My wife, on the other hand, is very creative and artistic, so tracking things in a structured sort of way has never been her thing. However, she has always had an income on the lower side so keeping track of spending has always been crucial. She is amazing in the fact that she just knows in her head roughly what her expenses are each month and had the discipline to not spend more than that, set aside some for fun, and save the rest. The best part is though they are totally different approaches, they worked for our situations. When we got married we both brought positive net worth's to the table, so our combined net worth was bigger from day one. 2. Were there any immediate things you have to give up or change in your budget when the baby came? The first thing was dropping down how much we were saving each month. Now before everyone freaks out let me explain. When we got married the only debt we had was the mortgage on our very modest home and our combined income was substantial compared to our cost of living. 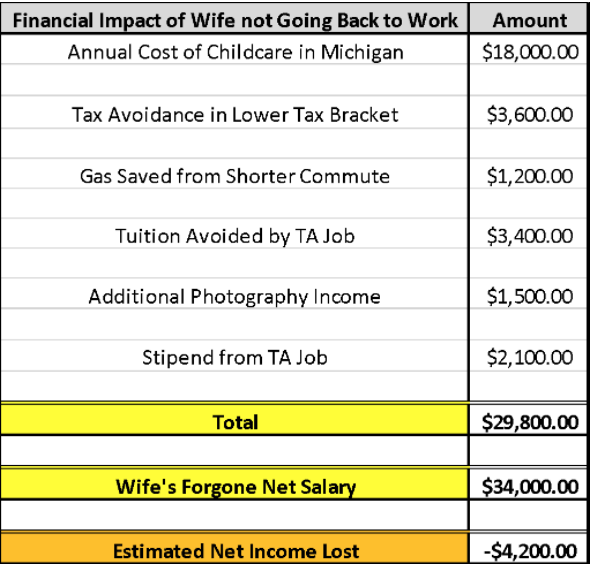 Before my wife stopped working, we were easily saving 50% of our income, not including retirement contributions. So, the first thing we did was drop our savings down to 30% per month to help make up for losing my wife's income. In terms of expenses, eating out was the first thing we cut way back on. We were already running on the high side in that category but then you add a baby in the mix and we just didn't have the time. Funny how that problem almost fixes itself! After that, we both had a monthly allowance for wants and fun stuff, so we cut that in half. Again, taking care of a baby eats up a lot of your time, so you end up wanting less stuff anyway. Lastly, we canceled cable. Even though my wife is home more now, we just found it was getting in the way of truly connecting with our child and stopping us from getting the ever growing a to-do list a baby brings along as well. We've been running this new budget for almost 7 months and it just feels right, so we'll forge on until something changes. 3. What are some unexpected expenses that came up with having a child that you weren't prepared for? First things first, no matter how high your deductible in on your health insurance, you’re going to hit it. I think the final bill for having the baby and two nights in the hospital was 4 times our deductible, yay health insurance! However, you save for health expenses, make sure you have enough there to cover the cost. Also, sometimes you know you need something, but there are multiple options. Every kid is different so you don’t know if something is going to work until you try it. For example, we went through 3 breastfeeding pillows before we found one that made both my wife and the baby comfortable, crazy! So there will always be those things that are trial & error to find what works and trust me, it’s worth the money. Other than that, I can’t say we were caught off guard by much. My wife and I both spent so much of the pregnancy nailing down exactly what it was going to cost so we could budget accordingly. 4. You mentioned that you both made the decision that your wife would not go back to work. What made you come to that decision? Honestly, it wasn’t one big thing, it was a bunch of areas of our lives that would improve/be enabled if she stayed home. All of those added together made the decision seem like the natural way to go. First and foremost, we both just really liked the idea of my wife being home every day with our son raising him and taking care of him. It’s not that we don’t use daycare, but neither one of us were super fond of the idea of dropping off a 2-month-old to daycare 5 days a week then my wife’s maternity leave ended. Second, my wife had been teaching at the same charter school for almost 5 years and she was really starting to get burnout. The job was way more stressful than the pay and the school was hemorrhaging teachers because of it. Neither one of us wanted her to have to carry that stress once the baby was born. Coupled with that, we live 10 minutes from her stressful job and an hour from my job, which I love & produces our income. My wife not going back to work will enable us to move closer to my job so that I don’t have to fight an hour or more of traffic every night and can get home sooner for that priceless evening family time. Also, from a financial standpoint, my future reduced commute should save us over $1,200 in fuel cost annually, not to mention the time spent on the road. Lastly, my wife staying home allows her to finish her Master’s degree in Art Ed and for way less money (let me explain). Right before having the baby, my wife was down to her last two classes, both of which were studio courses. She had never been able to take those courses as they are only offered during the week and of course she was working full time. Now that she is staying home she took one this semester and we just had to take our son to daycare for 4 hours, twice a week. She’ll do the same thing next semester and graduate in April. The final kicker is that since she is staying home, she could accept an offer to be a grad assistant next semester so her tuition for her last class and thesis are free and there is a $2,100 stipend! So yeah, looking back we had a lot of little reasons that added up to her staying home really make sense for us and our situation. 5. How did you prepare yourselves to go down to one income? But I also wanted to know how much money we were giving up when you compare income lost vs. money save from things live child care avoidance. As you can see below its “almost” a break-even proposition. Based on our research it was going to cost us ~$18,000 for annual childcare so we are avoiding that. We were dangerously close to bumping up to the next income tax bracket but my wife no longer getting paid to start in August kept us under for this year and we will have a big cushion next year. That keeps $3,600 of take-home pay in my income. As previously mentioned will be moving closer to my work which saves commuting costs and then you have the tuition avoidance and stipend for my wife being a grad assistant next year. Lastly, it has allowed my wife more time on the weekends to grow her side hustle photography business! Everything said and done we will probably end up with ~$4,000 less of income every year. With the flexibility and comfort that my wife staying home brings to our life, it is so worth it! 6. Were you worried that it wouldn't work? I think anytime you remove such a large chunk of money from your income you are worried that it might not work. It is nerve-wracking for sure. We spent so much time discussing it, fine-tuning our new budget, and working the numbers above that we didn’t really hesitate to pull the trigger. At the end of the day, we felt we had a good plan in place and we know we have the discipline as a couple to stick to it. 7. What are the biggest changes that you've made in your lifestyle after going to one income? A big one has been just adjusting our mindset to know that we are still doing a good job when it comes to our finances. When you are used to saving 50% or more of your income and you drop down to something closer to 25-30% you kind of feel guilty, but when you take a step back that’s still pretty awesome. Especially when you drop an income and add the costs of having a baby. As mentioned before, we eat out less and spend less on personal wants, but those voids are more than filled with the joy of time spent with our child and the journey of parenthood. 8. If you could do everything again, would you change anything when it came to your financial strategy? Honestly, probably not haha. We spent a lot of time running the numbers and laying out how we were going to offset lost incomes by avoiding expenses. Everything has been running to plan so far. We knew we valued having a parent at home with our child more than my wife’s income so we adjusted our lifestyle to make it work. 9. For any parents out there considering the same path that you and your wife took, what advice do you have for them? Run your numbers, plan, trust that plan, stay disciplined, and execute! Like us, if you’re not able to fully offset an income lost, it’s ok! Once you have that child, money falls down the list of priorities in your life (and that’s coming from a couple who is way into personal finance). From a more tactical standpoint though, don’t buy into the whole baby craze where you must have every baby-related thing under the sun. Talk to friends and family and get a sense of what is truly a need versus what it just a want. We spent a lot of time doing this and felt like 99% of the items on our baby registry were a need. Everything else we either bought used or scoured the internet for a great deal. My wife joined a mom to mom group for $5 and we get tons of stuff used for like 70% of the original cost and sometimes even end up selling things back when we are done with them. Things like diapers and wipes that you must buy new, a Costco membership goes a long way. Cheap and in bulk, because trust me, you will go through some diapers! There is no doubt having kids cost money, but if you take the time to really find out what you need, it doesn’t have to break the bank. 10. What's ONE thing that anyone with a young child could do right now to save money? Besides what I discussed above, with an emphasis on a Costco membership, it would be to get OUTSIDE! It’s completely free! There is no toy, screen, or gadget we could put in front of our child that could equal going outside, he loves it! There is something about the fresh air, coupled with the thousands of things for him to look at, touch, and feel that make it a child’s paradise. Again, lots of people get caught up in the baby craze and that they must have the latest toys and gadgets. In reality, everything your child needs to develop is right outside your front door. They won’t remember the things you bought them, but they will remember going for walks, playing in the leaves, being pushed in the swing, and going down the slide. Any financial tips for new parents? I appreciate this post. My husband and I never had to really give up an income. We were married for a year before we began having children. I worked, but we used that income to pay down student debt and save mostly. We planned everything in our budget from the beginning to reflect just my husband’s income – even our mortgage. I quit my job to stay home with the kids and I would have it no other way. I love it. There are things I wish I could have changed – like how much I “wasted” on groceries and stuff that could have been used toward debt, but we are making it! We have about a year and a half and our student debt will be gone forever! 1. Try to buy in bulk and use coupons when possible. We have a church group that buys bulk meat/cheese etc. for much better prices than store that we break up amongst a few people. 2. Thrift stores! I love community aid. Baby clothes are so cheap and most are nearly new. They aren’t in those sizes long! 3. Know when to say no. Especially when the kids give you the “eyes” for that candy bar. It’s okay every once and a while but don’t make it a habit. My husband and I were on a tight budget for our first 4 years about of school due to student loan debt. Fortunately for us, I am in healthcare, switched to night shift so we only had our children in daycare 8 days per month based on my night shift schedule allowing me more days off and I also worked weekends. Formula and diapers were an added $300-400 per month (only was able to breast feed the second due to complications). We found a quality daycare that allowed us to pay for the 8 days per month (rare), and by the time the oldest was 3 1/2, I was able to go part time because we paid down our debt and continued our tight budget. I never felt I could ever quit work entirely because of fear of losing my experience and not being employable in the future. I love it! I was never able to stay home, but I was a teacher so l had a lot of time off and worked close to their school and got to see all their performances. When they were babies, my in laws took care of them, so it all worked out. When I’m a grandma, I plan to watch the kids because it’s a lot of work to be a working mom and I am able to help. This is a great post. My husband and I did the same thing in choosing to drop my income and stay home with the kids. The easiest way to test the budget, in my opinion, is to just stop using one income. It’s super easy to change your direct deposit. Move it to another account, another bank, whatever. Just make it disappear and see how your finances work without it. During that time, just let that income save and build up. It’s win win either way and helps you really get an idea for the practicality of dropping an income. I have been lucky enough to be a stay-at-home-mom right from the start. Graduating from college, eloping and delivering our first baby within 6 months… let alone on one income was no small task. The single biggest thing that helped us was choosing to cloth diaper. We have easily saved thousands (between our two children) by choosing to not flush that money away (pun intended). I used these too!! People used to think I was so “economical” 😀 That made me laugh…I did it for that & because it just seemed the right thing to do. A little more laborious but in the end, so worth the savings to our pocket book & the environment! Plus I could even sew the inserts myself 🙂 This saved us thousands as well!! Great post Bobby, and thanks for taking the time for this Brad. It’s an important topic. Completely agree with number 10. GET OUTSIDE! It’s free, it’s fun and it’s good exercise. One way that parents (myself included) try to ‘keep up with the Jones” is by doing lots of fun (see: expensive) activities that we see others doing. Trampoline parks, waterslides etc…it’s all fun, and in my opinion, best reserved for special occasions. End rant. Thank you for posting this! I am pregnant with our first and we would SO love to go down to one income once the baby comes. The cost of living in San Diego is ridiculous though so we really need to sit down and figure out how we can make it work financially. This post got me all fired up to see how we can make it work! Cloth diapers at home & save the disposable for outings. Make your own baby food … SO easy. If you can swing one income, go for it. My wife’s income before children was only slightly higher than the cost of day care. Combine that with our first child being born two months early she never even considered not staying home. Because of her one on one time with the kids they are ahead of their peers too in many areas, wich I don’t think would have happened in day care. A side perk mentioned in the post is the tax savings. It’s not just for right now though. I take this opportunity of only having 1 income to contribute to my Roth accounts to pay that low tax now and save big later. As a couple currently with 1 income, this will be the least taxes you’ll ever pay. Leaving work while my kids were young was the most rewarding accomplishment to date! Not only was I able to attend their sporting events, practices & school functions, I was their rock. My kids used to hear their friends say “your mom will help us with our project, take us to practice, allow us over, etc etc” because I was home & able. It made my day meaningful & as indicated above, the expense of that as little as it truly is, was worth a million bucks!! I was envied by all other moms who “thought” they HAD to work to make ends meet. I dont’ know how many times I was asked “How do you do it?” I simply explained that it was a simple transition because it was the right choice for us. We made it work. One thing I did do was take in other children before & after school to supplement our income. It wasn’t much but it served us a dual purpose…. a bit of a side hustle for me & a way to socialize the children…even mom gets boring sometimes! Great article!! I think if more people wrapped their heads around this concept of raising their own children, all of society would be better for it! Just my 2 cents…. Children can be expensive! One of the biggest is childcare, and once you take that out of the picture because you’re staying home, you are saving so much money. After 6 years of wanting to stay home, I finally took the plunge this past May. It was a hard decision for me because I put in so much time and money for my schooling as a pharmacist. It just seemed like such a big sunk cost if I left my big salary that required such high education. But, you couldn’t put a value on how being a stay at home parent makes you feel. And now I’m saving $20,000 that I was paying to day care each year. Biggest money saving tip is shop second hand! A baby goes through stages so quickly that things are not used that much to be in disrepair. We’ve bought strollers, high chairs, clothes, toys, all second hand and have saved tons versus retail cost. The only thing I wish I had done differently with my three kids is using cloth diapers versus disposables. If I calculated how much we spent from newborn to training pants for my three kids, it would definitely pay for a year of college somewhere. I enjoyed reading this post. It reminded me of almost 5 years ago when my wife and I found out we were expecting twins. I was 25, she was 24. Married for about 5 months at that time & living in our new house… on entry level salaries. We made it work. Didn’t have a ton of disposable income but always made my 401K a high priority. Some months we had less than $50 left in checking after the mortgage came out. Fast forward to 2017- I turned 30 this year. We now have 3 kids. I’ve advanced along further in my career, and we have a good automatic savings/forced scarcity plan going for us. Bring on 2018! Great post full of useful advice! My wife and I are planning on having a child soon, and I’ve been reading up on the baby craze you mention, and separating those wants vs needs in terms of baby stuff. So it’ll be critical to keep that in mind. In terms of income, though, I don’t currently see a way for us to drop to one income. When I was born, my mom went part-time, and that worked for my parents. It might be a viable in-between solution. I’m glad I didn’t get to baby making yet. Still working on other things before I get to that. Hopefully someday before I get too old. Years ago we went from being a two income couple to a single income family. We have 3 kids now and my wife still only works part time and we also have some side gigs to help supplement our income. It’s definitely tougher to live on only one income and you need to be prepared to make sacrifices. It’s tough to see the two-income friends doing things that you have to turn down because you can’t afford it. But at the same time, I had tremendous peace of mind knowing my kids were home with their mom and I didn’t have to worry about daycare. There’s no right or wrong though, it’s really a personal choice. Definitely cloth diaper and breastfeed if possible! Last fall I had to buy disposables for my two kids (with sensitive skin) for a hurricane and 9 day power outage and spent $71. To diaper those two children the last 3 years in cloth I’ve spent $240. I breastfeed and then don’t buy baby food, instead, I do baby-led weaning and the littles get to the point of eating what we eat at a young age. My 13 month old knows how to properly put a loaded spoon of mashed potatoes in her mouth. People say that kids are expensive, yes, there are things you must purchase for them, but kids need love and a present parent.